“You are the full circle. Within you exist the power to create, nurture and transform. Don’t be afraid to speak for yourself and keep fighting for your dreams. Do this world a favour and don’t hide your Magic!”– says Priti Shah, a distinguished personality known for the courage of one’s convictions and a quintessential of hard determination & passion. A Mass Media graduate and an MBA degree holder, Priti comes from an 80+ year-old-running business family in the field of Ayurveda. No wonder entrepreneurship was in her blood. Prior to setting her ship sail, she had worked with some of the leading organizations such as Barclays, Bag Films, GroupM, People Group in the areas of marketing, communications, digital marketing, operations, strategy, retail, and others. Observing her family business being built for three generations one thing that was always clear in her mind was to build an empire of her own. And, the call was so loud that she dropped her job to make a dent in the universe by scripting her own success story. “Nothing can keep an individual behind if they cultivate and live by the motto ‘Why Not’ from a perspective to better all things. Be it in eCommerce, education, banking, fashion, retail, and everything under the sun, the unbridled enthusiasm to change the world can bring a huge difference with their ideas, seek solutions to achieve future goals, run business successfully and give rise to a new sustainable ecosystem,” says Priti Shah, Founder & CEO, BrandVU. They say behind any successful person is a strong motivator, and this has been the ultimate truth in Shah’s life. 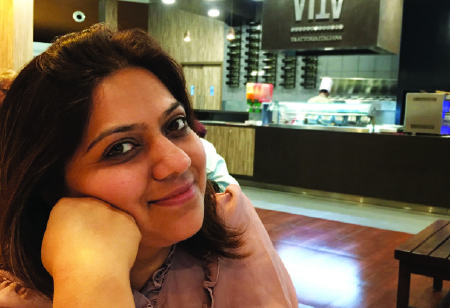 Taking inspiration from her father and being encouraged by friends and fellow industry mates, Priti’s journey was relatively easier as she had experienced business from a much closer view in terms of growth; battle an industry meltdown or a competitive market. Another crucial motivating factor was to break the glass ceiling as being the youngest daughter of the family and create something exceptional, yet extraordinary. Thus, picking the baton she moved ahead. Interestingly, even much before the company’s service tax registration, BrandVU bagged it’s the first retail audit assignment for Parle for their stringent operations. Since then there was no looking back for Priti and BrandVU. BrandVU today has established itself as a boutique brand management firm which primarily specializes in brand and retail consulting. It now offers Marketing and Business Consulting along with end-to-end delivery across India, helping new businesses scale up. Moreover, the company has branched into Analytics, Creative Services, Digital Marketing, Social Listening and Investment Advisory. “Since 2010, we’ve honed our retail operation and proudly sport a robust network in more than 70+ cities in India which not just gives last mile access but also acts as a great network for easier and faster deployment of any program, activation or project on the ground.” Also, a hobby of her gave shape to another dream in the form of 'House of Edi' – an In-house wellness brand. "It's going to happen because I’m going to make it happen"
BrandVU’s service credo reflects the essence of VU- 'a measure of sound’–to 'Be Heard, Be Seen’. With its own proprietary retail analytics SaaS-based software RADAR it helps business owners to take key decisions in real time, assist brands to craft the right display/engagement strategy and more. Other than achieving heights in the vast business landscape, Priti has earned a name for her with being an elected member of the Global Shapers Community from the World Economic Forum. Creating a win-win situation for the organization and its clients, BrandVU has always encouraged women employment and entrepreneurship. Led by a team of rock solid professional experience and repute, BrandVU in the near years strives to clinch the opportunities and help new businesses and start-ups achieve their dreams. BrandVU’s service credo reflects the essence of VU-'a measure of sound’–to'Be Heard, Be Seen’. With its own proprietary retail analytics SaaS-based software RADAR it helps business owners to take key decisions in real time, assist brands to craft the right display /engagement strategy and more.